FA 2 Biological Science/ NS Question Paper For 6th, 7th, 8th, 9th, 10th Class Slip Test Questions : FA 2 Biological Science/ General Science Question Papers, Project work 6th, 7th, 8th, 9th, 10th Classes. FA II General Science/ Biology Slip Test Question Papers, Project Works for 6th, 7th Class. 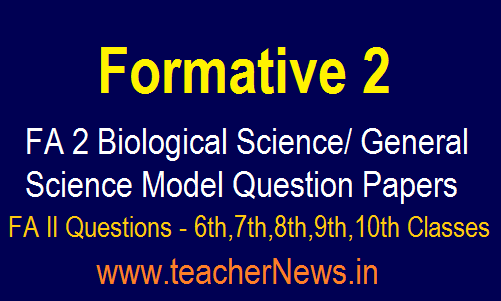 Download Formative 2 Biology Question Papers, Model Project Works Download. Formative 2 Biological Science Question Papers, NS Model Project Works Steps 6th to 10th Classes AP & TS, Download FA-II Slip Test General Science Question Papers, Formative Assessment 2 Model Project Works VI to X Class All Science Subject AP and Telangana. SSC FA 2 Physics question paper, 9th Class FA 2 question paper, 8th Class FA 2 question paper Prepared by Our Teachers in Telugu Medium and English Medium. Formative 2 Biological Science/ General Science Question Papers, Biology Formative 2 Model Question Papers – Biological Science Project works Download. Formative 2 SSC NS/ Biological Science Model Slip Test/ Question Paper 2018 for 8th, 9th, 10th Class CCE 6th class and 7th Class FA 2 General Science Model Question Papers. FA2 Biology Project Works SSC FA 2 NS Telugu/ English Medium Slip Test Model Question Papers 8th FA2 NS Question Papers 9th Class FA 2 General Science Formative Assessment 2 Slip Test Download 10th Class Formative Assessment Question Papers PDF FA 2 NS Free Download Formative Assessment Sample Question Papers Formative Assessment Model Question Paper Download. FA 2 Biological Science/ General Science Question Papers For 6th, 7th, 8th, 9th, 10th Class. Formative 2 Biology Model Question Papers Download.